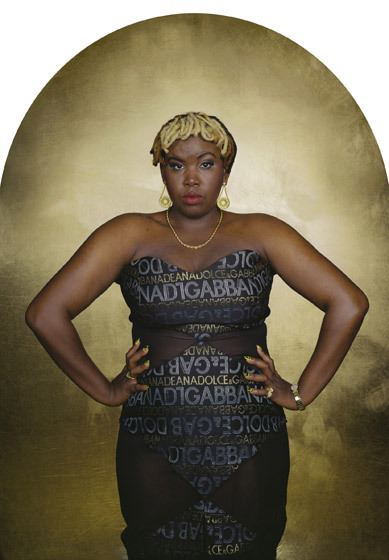 Gispert does large photographic canvases of his work. 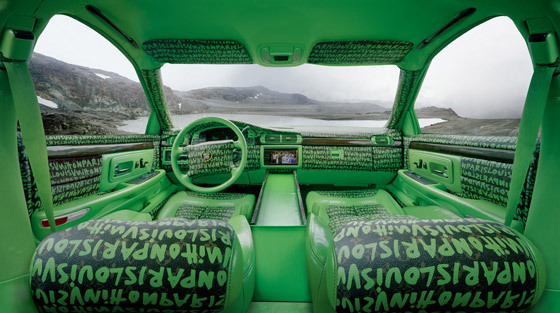 The artist spent time combing the U.S. to find people who create custom vehicles in their own backyards and garages. 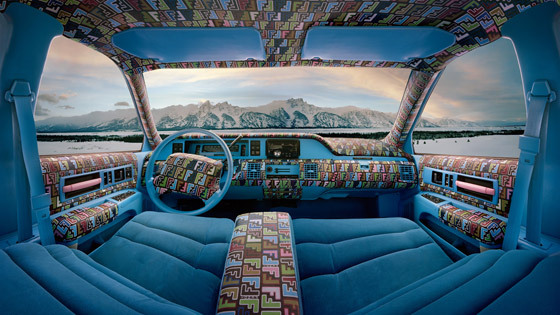 These people reupholster their cars with iconic designer print fabric – and then, some go so far as to custom design an entire lifestyle – clothing, accessories – even entire bedrooms! Counterfeit designer applications to vehicles, furniture and clothing started right here in New York City in the early 1980s. Luxury status symbols associated with the very rich were, for the first time, copied and custom designed to create this new class of feigned-wealth. Decepción is the Spanish word for disillusionment or disappointment. It also, of course, echoes the English word “deception.” Both meanings are reflected in Gispert’s photos, and in the everyday life of everyone who accessorizes with counterfeit goods – an attempt to envelop oneself in a capitalistic fantasy that may never be attained. 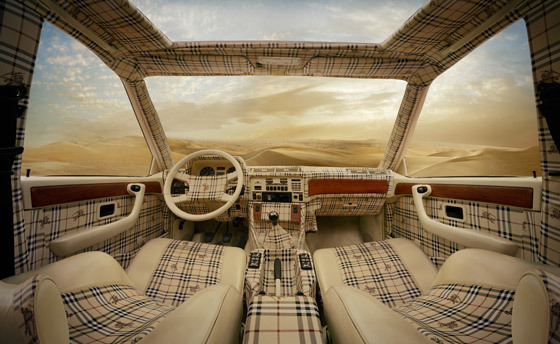 Gispert attended car shows across the country and discovered and photographed many of these counterfeit automobile interiors bedazzled with logos, from a Burberry-upholstered BMW to a Gucci-themed Mercedes. He then combined each photo with another photo of a vast and desolate landscape to create his finished canvas. The windshields for these cars provide the window to the outside world. The legal issues involved with the purchase, sale, and promotion of counterfeit goods used by these people were never discussed. However, everyone knew their material was fake – an obvious fact that makes the impact of these photos that much more powerful. These vibrant, colorful pieces of work, though huge in their actual size (55″ by 89″ to be exact!) are even more enormous in what they say about our culture and the people who have transformed the interior of their car. Are they doing this simply to impress their friends and neighbors with something that appears very valuable, or trying to deceive themselves into thinking they can afford such a luxury? Are these pictures trying to capture a glimpse of our society’s demand to prove status through material things even if it just looks authentic? If so, then who exactly, is being deceived? Does enveloping oneself or one’s outside surroundings in designer goods – even fake designer goods – make one feel richer on the inside?